The Pacemaster Gold Elite VR treadmill features a big 15% incline, a 400 lb user capacity, an advanced shock management system to lessen the impact on your joints, and a variety of intense programs to help you achieve your cardio and fat burning goals. In addition to Manual, QuickStart, and Calorie Coach, the Pacemaster Gold Elite VR treadmill has 9 programs (each with 9 intensity levels) including High Shaper, Glute Toner, Waist Reducer, Hill Intervals, Speed Intervals, Mixed Intervals. It also has 3 Custom Programs to design your own workout, or choose from 5 Heart Rate workouts including Heart Zone Monitor, Target HRC, Fat Burn Zone HRC, Cardio Zone, and Interval HRC. UPDATE: Pacemaster is out of business and their treadmills are no longer available for sale. 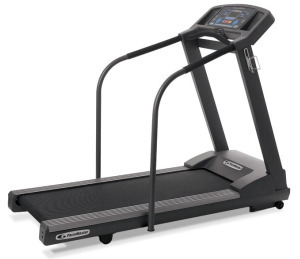 Check out Precor and Life Fitness for comparable treadmills. Experts cite high quality components that are the guts of this great machine including: a welded aircraft grade aluminum frame, a dual microprocessor digital motor control system, a 3 CHP motor, a 1000-lb thrust incline motor, a maintenance-free medium-density fiberboard phenolic surface deck, 2.5" precision rollers (with permanently lubricated sealed bearings), and a 1" thick stretch resistant, maintenance free belt that is rated for 10,000 miles. 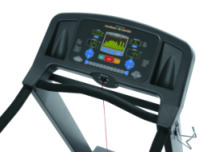 Treadmill reviews by customers are universal in their praise for the Pacemaster Gold Elite VR. It lacks nothing in style, appeal, or value, and it’s easy to see why this model lands on so many Best Buy lists. 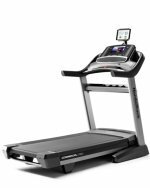 Like its sibling, the Platinum Pro VR, this treadmill features extras including automatic warm up/cool down, 4 User IDS, Express Speed and Incline Keys, and a Fitness Evaluation. It also comes in a folding model (add $200). This model is so well designed that it doesn’t have any major issues to mention, or even minor ones to nitpick. It rates high for its roomy walking area, challenging programs, noise, cushioning, power, quality components and overall value. If you can find it for $2,299 or less, the Pacemaster Gold Elite VR treadmill rates a Best Buy.